Master Chiao Chang-Hung was born in the Spring of 1914 in North Eastern China near the mountain of Wu Lu-Shan. When he was a young boy his father hired a body guard to watch over him and teach him Shaolin kung-fu. He became very good. At the age of sixteen he was given the honor to train at the Little Nine Heaven Taoist temple under the Honorable Master Lushan Daoren. After training at the temple for several years learning the internal system of Little Nine Heaven Wu Tao he left and went to college in Peking. There his father introduced him to his friend Master Liu Tsu-Yen in Shen Yang City where he began learning Hsing-I. He also learned Pa-kua from Master Yan Ju-Lin, who was the top apprentice of the Pa Kua palm and Ma Wei-Chi’s best student. The war broke out and he fought the Communists. He was Chiang Kai-Sheks number one body guard. They fled to Taiwan where he continued training and soon started teaching. He became the head of the Taiwan’s kung-fu association. He was challenged by many kung-fu experts but was never defeated. He is retired from the Taiwan’s government where he worked as the head of the FBI. At a young age of 85 he still teaches a few selected students the advance levels of kung-u. Master Chiao is a living legend in the martial arts world of today for his many incredible skills. In recent years, Master Chiao has taught only a few personally selected students the complete system of Little Nine Heaven kung-fu until his death in 2001. After years of training James McNeil received his sword from Master Chiao. 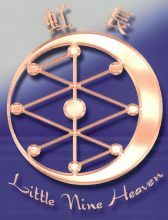 This certified James McNeil to be one of only ten instructors around the world to teach the Little Nine Heaven system, which is one of the oldest and truest Taoist systems known today. Master Chiao has sent his selected disciples to various countries such as Japan, France, Italy, West Germany, Philippines, Singapore, Thailand, Malaysia and the United States to teach this system. James McNeil is the only American. Master Chiao advises students wishing to study the system to seek out only certified teachers; they alone know all three skills comprising the Little Nine Heaven system.